This is the official user-support page for the UiT Student app. 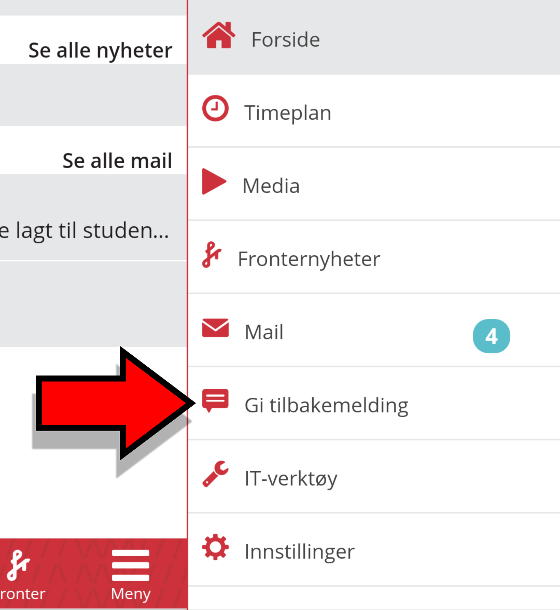 Here you will find relevant and updated information about the UiT Student app. The page is aimed at students, but can also be of use to faculty and administrative staff who have questions about the app. August 15th, 2017 *SOLVED* The error was corrected as of 17th of August 2017. Apple users are reporting that they can search and find the app in Apple App Store, but are unable to download it. Error message: "this article is no longer available". This error is being investigated, and will be corrected as soon as possible. Go to "Menu" > "Give feedback", or send an e-mail to orakel@uit.no. Always log in with username written like this: abc123. Do not use this variety: abc123@uit.no. Did you change your UiT account password after you started using the app? Please log out of the app and log back in to make everything work properly again. Always keep your phone up to date with the phone's most recent operating system. Always keep your apps up to date. We recommend using WiFi for downloading updates. Something missing in Schedule, Fronter News or one of the other pages? Try a "pull to refresh"; pull down the page with your finger to update the page. This also happens automatically every 30 minutes. Still experiencing trouble? Let us know, and include your UiT username in the e-mail. Missing something in the Schedule? First, please check that you are actually enrolled in the subjects/classes that you are missing. Do this in Studentweb. Change accordingly. Try a "pull to refresh"; pull down the page with your finger to update the page with the most recent data from the servers. You can also check your personalized schedule on Min Side. Does this show different activities than the app Schedule? If so, pease report the error. Are you enrolled in all the right subjects and are registered for correct exams, but neither the app nor Min Side display the information properly? Please consult a student advisor at your faculty or at the student expedition office. If the displayed information is still erroneus after adjustments have been made, you should report the error. In some rare cases, users may experience erroneus activities in their Schedule, making the app display lecture activities on multiple campuses on the same day. Report the error. Did you change your UiT account password after you have starting using the app? Please log out of the app and log back in to make everything work properly again. As far as it's technically possible, we try to include information about on which campus the activity is taking place (some users have activities on multiple campuses). In those cases where it is not possible, it remains the user's responsibility to keep track of where the activity is happening. The user is supposed to be directed to mail.uit.no and the Outlook Web App whenever she clicks on an e-mail in the app. In some cases the user must first log into Outlook Web App (OWA, e-mail in browser) on the webpage mail.uit.no to make the e-mail-server start pushing out e-mails to the app. Did you change your UiT account password after you have starting using the app? Please log out of the app and log back in (with the new password) to make e-mail work properly again. Missing or erroneus information about subjects or exams may be caused by two things. The first is that you are not actually registered in the subjects to which you believe to be registered. The second is that you have forgotten to register for the exams to which you intended to be registered. Firstly, users should check Studentweb. Please consult a student advisor at your faculty or at the student expedition office, the error may be caused by faulty lecture plan data in the lecture planning system, TP. If the displayed information stays erroneus after adjustments have been made, you should report the error. Everything seems OK in both Studentweb and on Min Side, but remains erroneus in the app? We might be having a "bug" in our app. Please report the error. The app is updated regularely with accumulated corrections, and minor and major changes. Under Settings users will find the app version number. As of 2nd of February 2017, the most current version of the app is version 0.0.20.